We citizens battling for civil rights on the Internet will meet our obligation and fight the good fight. We’ll stop this attack on the Internet and democracy sooner or later. 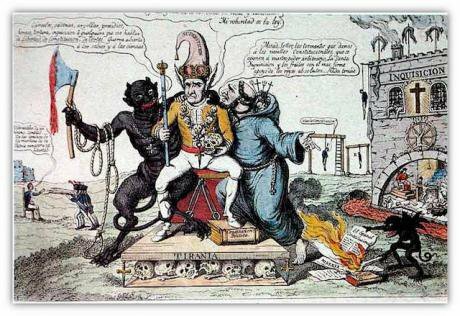 Spanish-language cartoon Tiranía (Tyranny). Superstition sits on the throne, advised by a priest and a devil by Claudio Linati, 1826. Wikicommons. Public domain. Xnet (https://xnet-x.net/en/), an activist group working for civil rights in the Internet, is the founder member in Spain of the #SaveYourInternet coalition, which has among its participants groups such as the Electronic Frontier Foundation (EFF), European Digital Rights (EDRi) and others. We have come together to organise a campaign to inform the public about the hidden dangers of the new European Copyright Directive. With the approval in the European Parliament of the final text of the Copyright Directive, which will be definitely put to the vote in a very few months’, the European Union has lost a historic opportunity to produce copyright legislation adapted for the Internet in the twenty-first century. What the European Parliament will finally vote on is a technophobic text, tailor-made for the interests of the copyright monopolies which, moreover, doesn’t guarantee the right of authors to have a reasonable standard of living as a result of their work. If the law is eventually passed, it will be used for wholesale curtailment of freedoms and more censorship, in keeping with the bizarre idea that anything that doesn’t produce hard cash for the major players – which doesn’t mean authors! – has to be prohibited and eliminated. The amount of money the real authors receive in the end is zero or almost zero. This is a tragedy for workers in the domain of culture who (with a few, brave, and praiseworthy exceptions) have once again been frivolously incapable of informing themselves about the real state of affairs. They have passively swallowed the version fed to them by their masters and, avidly playing the victim, have become the chief mouthpiece of freedom-killing propaganda without the slightest understanding that this is not going to enhance their rights but will do away with the rights of everyone. Alarm bells started ringing almost two years ago when we discovered that, rather than being a proposal for an obsolete copyright law, the directive is being used as a Trojan horse to introduce surveillance, automatic data processing, government by opaque algorithms, and censorship without court orders, etc. Article 11, otherwise known as the “Linktax” article, has created a new economic “right” for magnates of the written press. This ‘right’, moreover, implies indefinitely restricting the possibility of citing the press online. This perverse measure will be the equivalent, on a European scale, to the “Google tax”, which is already in force in Spain and Germany. Even its promoters were soon to regret it, when Google shut down Google News in Spain after it was approved. The Google tax is paradoxical and those responsible for initiating it know very well it won’t work in Europe. For example, Xnet revealed that the big German publishing company Alex Springer was paying itself – having linked up to pay itself – in an outlandish pretence that “everything’s fine”. Where are they trying to go with this? What sense is there in this move by the press barons to push laws which prevent you from linking up to their content, disseminating it, and commenting on them? Is this just a mix of ignorance and greed, or something like shooting yourself in the foot? There is certainly something of this involved, but we believe that this is a mix of ignorance and greed which, in the end, means cutting off your nose to spite your face (when you’re trying to damage someone else’s face). With laws like this, the press barons can engage in legal harassment to the point of closing down social aggregators and communities like Meneame or Reddit, eliminating any new competitor, consolidating their monopoly, and thus becoming the lone voice on the Internet, the only ones who speak. In short, they are aspiring to become a new kind of television. Platforms – from medium-sized providers of services storing subject material through to the giants of the Internet – will be considered responsible for any copyright infringement committed by their users, and they are bulldozed into taking preventive measures. In other words, this isn’t a matter of eliminating content but directly preventing people from uploading it. Of course, nobody is forcing them to do anything. They are simply being made responsible for material uploaded by their users. It’s like a car salesman being held responsible for crimes committed by people who buy his cars. This can only end up with algorithmic upload filters being applied to absolutely everything or, in other words, prior, automatic, and massive Internet censorship. This can only end up with algorithmic upload filters being applied to absolutely everything or, in other words, prior, automatic, and massive Internet censorship. Recently, YouTube prevented the pianist James Rhodes from uploading one of his own videos in which he is playing Bach. This kind of “error”, which always favours privatisation of the public domain, is the everyday reality for all authors who use YouTube. And this isn’t just about the “errors” that lead to the privatisation of the public domain. It is about the difficulty or impossibility of uploading on the Internet any kind of derivative work: parodies, memes, remixes, fandom, satires, and so on or, in other words, the very essence of culture, political freedom and freedom of expression. This whole setup, which looks like a science-fiction dystopia, an impossible attempt to lock the doors when the horse has bolted, or an exaggeratedly grim prophecy being spread by concerned activists, is already being implemented today on big platforms. In this case, the platform would acquire all national and international licences and then make all contents available unidirectionally in such a way that users can’t upload content. Even so, in the case of Spotify, one of the few giants with the resources to do this today, paying the copyright monopolies has raised its overheads so much that, despite its commercial success, its medium-term sustainability isn’t guaranteed. If this is the situation of Spotify, it’s not difficult to imagine what will happen to medium-sized Internet companies. This model has another defect which is obvious to most artists. The amount of money the real authors receive in the end is zero or almost zero. These new Internet monopolies refuse to share the cake with the old copyright monopolies and therefore opt for large-scale, automatic filtering of all content. They will find it easier to adapt to Article 13 since now they will only need to apply the filtering mechanisms before uploading takes place. This technology, besides being opaque and exclusive, is very expensive. Since it will be obligatory, it will also mean that these giants are very unlikely to have competitors that have any chance of prospering. Google has spent approximately 100 million dollars to create the technology that has so far enabled it to respond to copyright claims coming in from only 1% of its users. The effect which these arbitrary regulations will have on free Internet conversation, on diffusion of culture and information, and access to them will be devastating. Whose rights are at stake? Authors’ rights (Droits des auteurs→ copyright) are important. But what are these rights? And which authors have them? Any democratic proposal seeking widespread consensus and aspiring to guarantee the decent employment of authors without jeopardising the basic rights of citizens would need, finally, to take a bold stand against the copyright monopolies and management entities which are suspected of abuse when not directly investigated, tried, and condemned, as we succeeding in doing with SGAE (the Spanish Society of Authors and Publishers). It should also take as given the fact that the concept of the author or medium has changed in the last twenty years. Since the earliest days of Web 2.0, the content generated by users has evolved from being an interesting social experiment to the digital reality in which we are immersed day in day out. In a society like that of Spain, for example, content generated by entities which were once “big” media now account for less than 5% of Internet traffic. The EU must respect citizens as content generators and not regard them simply as people who steal content generated by the elite. The EU must respect citizens as content generators and not regard them simply as people who steal content generated by the elite. No single company, medium, or author has written Wikipedia, or turned the Web into the repository of gazillions of videos, or generated hundreds of millions of tweets per day. We – the people – did this. The Internet doesn’t belong to them. The threats skulking behind the Copyright Directive are part of an attempt to stuff the genie back into the bottle and embark on an inquisition that would allow the oligarchs to take control of the Internet. Our politicians and big company bosses are envious of the Chinese model. The initial idea of the fathers and mothers of the World Wide Web and the Internet, as we know it, this idea of an open architecture for sharing links without restriction, was crucial to its success. And it would be radically undermined if the directive is approved. Now the EU wants to create an Internet with a licence. And since we are a civilised society, they can’t call it censorship so they say “copyright”. In the final vote, all the power and wealth will be on one side. We, the people, who are on the other side ­– in favour of freedom of expression, an open Internet, and copyright laws adapted to the twenty-first century, which will enable authors to make a decent living and not have to scrabble for crumbs dropped from the table of the Internet moguls ­ – will be vilified, slandered as thieves, hackers and pirates, and absurd allegations will be made against us. This situation has happened before. And what it most clearly evokes is the relationship between the invention of the printing press and the censorship of the Holy Inquisition. Inscribed in pen and ink. 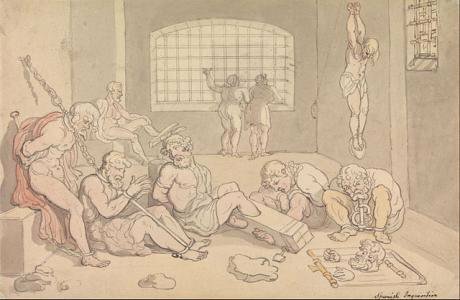 "Spanish Inquisition" by Thomas Rowlandson (1756 - 1827). Wikicommons/ Google Cultural Institute. Some rights reserved. What is the responsibility of artists and (left) political parties? The vote has not yet been cast. We have a few months to get everyone to understand the magnitude of the danger. We can win this battle. We have already won in extremis in other situations like the fight for net neutrality and ACTA, and we can do it again. - Artists who will step forward and say, “NOT in my name”. - A clear, effective, and non-opportunist stance from the left in favour of an open Internet and freedom of expression. The left instead tends all too often to cultivate a technophobic position which contributes towards censoring narratives. The case of Spain is paradigmatic. The PP (right-wing party) and PSOE (“socialist” party) voted and will vote in block for whatever the Copyright Monopolies and the SGAE tells them to vote for, which is to say what most favours control and censorship. But the example of the left-wing electoral alliance Unidos Podemos is also instructive. They joined the SaveYourInternet campaign at the last moment in order to coopt these citizen-activists. The next day, one Anova and two Izquierda Unida members of parliament abstained from voting and nobody in either party as much as batted an eyelid. It would seem that none of our politicians take these basic rights very seriously. We citizens who are active in battling for civil rights on the Internet will meet our obligation and fight the good fight. We’ll stop this attack on the Internet and democracy sooner or later, with or without the help of the “artists” or the “parliamentary left”, but not without bitterly calling attention to the dangerous future that is looming for freedom of expression and information, and our other freedoms in the new context of the digital age in which, again and again, the tool is being destroyed and the messenger killed in order to preserve a status quo that must not continue. 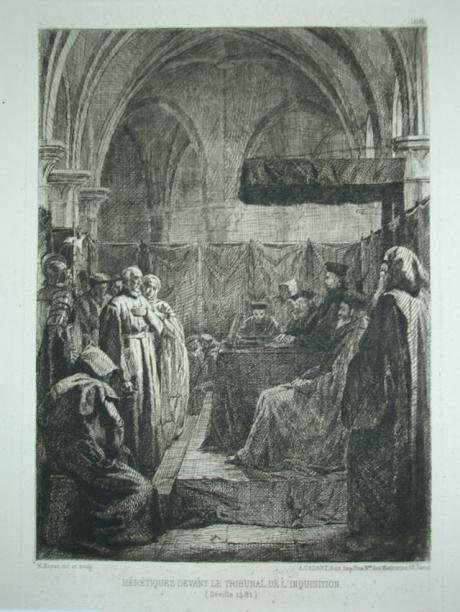 Heretics brought before the tribunal of the Inquisition, Seville by F.Moyse, 1870. Wikicommons. Public domain.